A proposed 1,260-unit housing development at the 65-acre former General Electric Gear Works property in Lynn would include residents-only access to a commuter rail platform two stops from Boston’s North Station. Developer Lynnway Assoc. LLC is pitching a $512 million, 1.5-million-square-foot redevelopment including six residential buildings. A MassWorks infrastructure grant will pay for traffic and water service projects serving a proposed 348-unit apartment complex at the former Beacon Chevrolet property on the Lynnway. Swampscott developer Charles Patsios acquired the property in 2014 for $7.6 million, three years after GE shut down the factory that had produced military vessel components since World War II. The developers are negotiating with the MBTA to provide “controlled access” to the River Works stop on the MBTA commuter rail’s Rockport line, according to a draft environmental impact report recently filed with state regulators. MBTA spokesman Joe Pesaturo confirmed that the plan is on the table. “The state is open to options and would work collaboratively should any development proposals move forward which may lead to the ‘flag stop’ being considered for improvements,” Pesaturo said in an email. Designs by Boston-based Elkus Manfredi Architects and VHB call for six residential buildings, 2,130 structured and surface parking spaces, a 43,310-square-foot resident-only sports club, band shell, volleyball courts and 16,000 square feet of retail space. The projected construction timeline is 2018 to 2022. The filing states that residents of the new Lynn Gear Works community would have access to regular commuter rail service at River Works, which is an 8-minute ride to Boston. The platform, located within a quarter-mile radius of the entire property, was restricted to use by GE employees in the past and has never been available to the general public. The development plan has been designed to allow future public access, with other large developments in the early stages along the Lynnway and waterfront, according to the draft EIR. NB Development, the real estate arm of New Balance, paid for the construction of a new $20 million commuter rail stop next to its 1.8-million-square-foot Boston Landing development in Brighton. That station, expected to open in April, will be open to the general public. Turning the city of Lynn’s neglected industrial waterfront into a destination for high-density housing and commercial uses has been a longtime goal of economic development officials, who see potential for large-scale projects along the lines of Quincy’s Marina Bay and the Hingham Shipyard. Real estate cycles and regulatory hurdles have set back groundbreakings, but the current demand for transit-oriented development continues to shape future plans for large parcels on both sides of the Lynnway. More than 100 representatives from some of the region’s largest real estate firms, including National Development, New England Development and Federal Realty Investment Trust, attended a bus tour of development sites in September. The Lynn Economic Advancement and Development Team (LEAD) team, comprised of state, local and federal officials has been meeting for the past year to address permitting and financing roadblocks. Last week, the Baker administration announced a $1.2 million MassWorks infrastructure grant connected to a proposed 348-unit apartment complex at the long-vacant former Beacon Chevrolet dealership property. Developer Arthur Pappathanasi is in conservation commission permitting for the $80 million project, located at the north end of a large stretch of waterfront behind a Walmart store. “What we’re finding in a lot of the Gateway Cities is the costs of construction are the same as Boston,” said Rep. Brendan Crighton, D-Lynn, a member of the LEAD team. Lynnway Assoc. 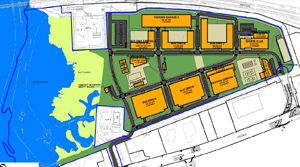 proposes a 1.5-million-square-foot redevelopment of the former GE Gear Works factory site in Lynn, including 1,260 housing units in six buildings. The property at 254-258 Lynnway is part of a 305-acre district rezoned in 2008 for nearly 6 million square feet of mixed-use development. Beacon-Bel Realty Trust of Marblehead acquired the 5.4-acre Beacon Chevrolet property in May for $2 million. To comply with state Chapter 91 regulations, the project would include a boardwalk running along the waterfront. The Lynn Economic Development and Industrial Corp. may seek funding from the state Seaport Economic Council, which offers economic assistance to 78 coastal communities, to offset the cost, EDIC Executive Director James Cowdell said. Uncertainties about transit connections also play into the site’s future. The property overlooks the ferry landing where a pilot program attracted more than 13,000 riders apiece during the summers of 2014 and 2015. The service to Boston’s Central Wharf was suspended by MassDOT in 2016 due to cost, but the city of Lynn last spring received a $4 million federal grant to purchase a 149-capacity ferry. U.S. Rep. Seth Moulton’s office invited Arthur Imperatore, owner of the Weehawken, New Jersey-based N.Y. Waterway service, to offer tips on how to operate a profitable commuter ferry. In the meantime, MassDOT has commissioned a sustainability study expected to be completed by the end of November to gauge the ongoing costs associated with the ferry.